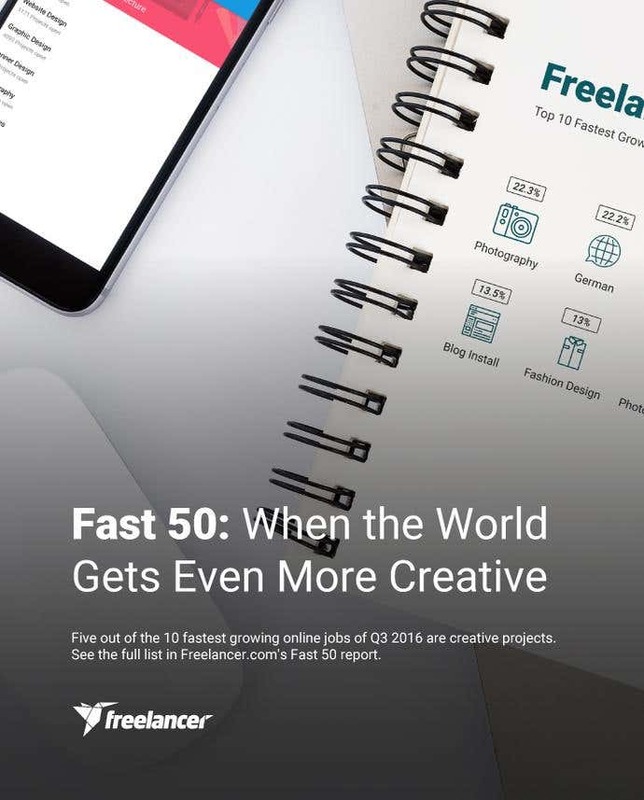 Freelancer.com’s Fast 50 Q3 2016 report revealed that 50 percent of the top 10 fastest growing jobs for the quarter are related to creative projects. 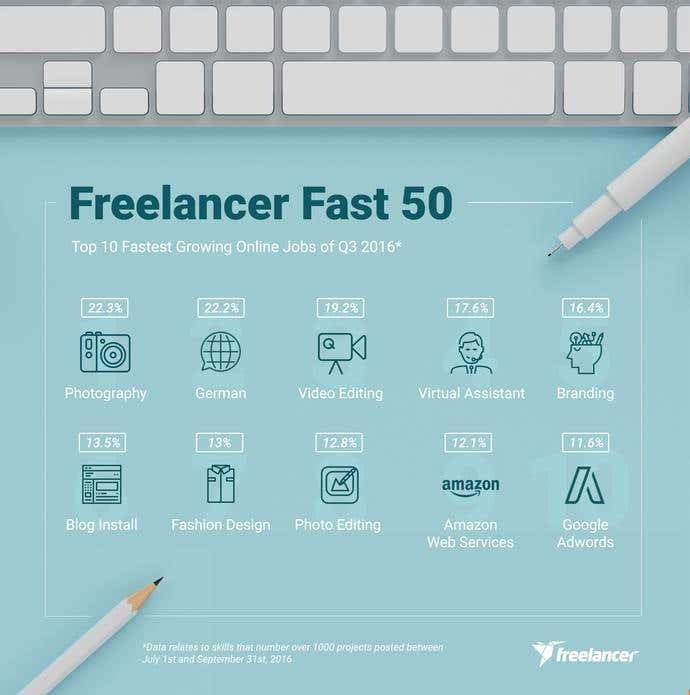 This was based on the review of 440,718 good jobs posted on Freelancer.com in Q3, jumping from 405,859 in Q2. Good jobs are projects that have been filtered for spam, advertising, self-promotion, reposts, or those that could not be fulfilled. While projects related to programming languages are still dominating the overall job numbers, creative projects are catching up. Photography jobs increased by 22 percent in Q3 compared to Q2, which made the highest jump becoming the number 1 fastest growing online job for Q3. More and more businesses are investing in having stellar images on their websites, ads, and social media posts among many others. Great photos speak a captivating mix of creativity and professionalism, which are both essential for branding. Video editing is the second highest creative project on the list sitting at number 3 with 19 percent increase. This can be attributed to businesses relying heavily on video marketing on social media and having video content on their websites. Jobs with German language skills shoot up to 22 percent increase from Q2. There was a sudden interest in the German language after the Brexit vote in Europe and how Berlin was trying to lure companies away from London and the UK. Know more about this story from the full report. Furthermore, we now have a German language support in our European offices to assist our growing number of users in Germany, which increased to 30 percent in the past 12 months. The demand for virtual assistants (VAs) rose to 18 percent as more entrepreneurs choose to outsource administrative tasks so they can focus on the growth aspect of their businesses. Hiring a virtual assistant is an advantageous move a business owner can do especially when employing a multi-skilled VA.
No matter how big or small an entity is, SEO is an important part of business growth these days. SEO jobs on our platform jumped to a 9 percent increase in Q3. Entrepreneurs should take note, though, that it’s not enough to please search engines. Google has been repeatedly saying that anyone who’s working on SEO should target real human beings. Projects related to branding (16 percent or 1,294 jobs), blogs (14 percent or 1,872 jobs), and Amazon Web services (12 percent or 1,679 jobs) also claimed their spots on the top growing jobs list for Q3. Note: Data relates to skills that number over 1000 projects posted between July 1st and September 31st, 2016, compared with those posted between April 1st and June 30th, 2016. Read the full report Fast 50 report in this link. If your reader can’t understand the words you use to explain what you have on your mind, there is no way they could understand your idea nevertheless.